Our Organic Wool dryer balls are made from premium 100% New Zealand wool and are a money and time-saving alternative to chemical-laden dryer sheets. Our dryer balls are a unique product designed to leave clothes soft and static free. When placed in the dryer among the wet laundry, the balls help to lift and separate the clothes, reducing static and drying time as well as leaving the clothes soft and fluffy. They work by improving the circulation of heat and air through the wet items. 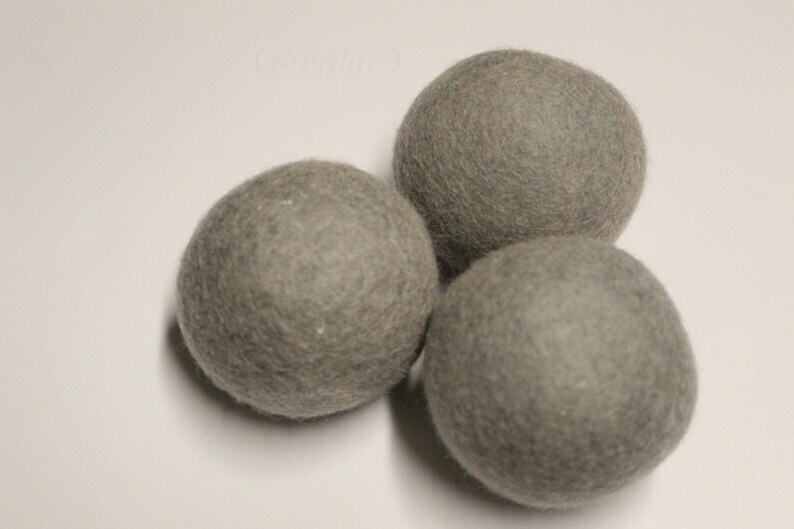 Sheep Soft Wool dryer balls eliminate the need for dryer sheets by doing the work naturally rather than chemically. Compared to the average price of dryer sheets, which must be purchased regularly, dryer balls usage saves a lot of money. Dryer balls are healthier for people and environment-friendly as there is no risk of chemical residue left on clothing and released into the air. They are absolutely wonderful for cloth diapers. They keep them soft and clean without the harmful chemicals. Wool dryer balls are a perfect gift for every occasion. - Place balls in the dryer with your laundry. Dry laundry on your normal settings?- Allow balls to air dry after use. - When using the dryer balls, splash a few drops of essential oil (lavender, lemon, etc) onto them making your laundry smell wonderful. A lil smaller than I expected but nonetheless excited to try them out & see if they help with the static!